Do Internet-connected books have a future sooner than later? Books that are connected to the Internet may have many advantages, but will publishers, authors and the public play along? The combination of two interesting articles I read today has my brain spinning with ideas about the future of writing, editing, and teaching and how they relate to the publishing industry. The first article I read was by James Bridle who runs the site booktwo.org, which is dedicated to discussing “the future of literature and the publishing industry.” He discussed the usefulness of maintaining a complete history of Wikipedia edits, using the “Iraq War” entry as an example. Bridle had this to say about the real value in maintaining the edit history in Wikipedia: “Everything should have a history button. We need to talk about historiography, to surface this process, to challenge absolutist narratives of the past, and thus, those of the present and our future.” I’ll come back to this thought process in a minute. The second article (which also makes reference to the first) that was the real catalyst for my spinning brain was written by Hugh McGuire for O’Reilly Radar, a site dedicated to talking about the future of tech. In his article McGuire talks about the highly contested idea that the Internet and books will have a full on collision sooner than later. He also highlights how in his opinion e-books are not truly Internet-connected books but rather only a dull step in that direction. The information contained in the e-book “live[s] outside of the Internet” he states, leaving users still frustrated that they can’t link to an e-book, deep link within an e-book, query across a subset of e-books or rarely copy and paste in one. McGuire goes on to talk about what is called an Application Programming Interface (API) useable for books. The API is essentially a piece of software that allows two entities to interact. For example, news agency USA Today announced today that it would open up its data using an API that would allow other entities to use USA Today’s data. Work has already been done on an application that compiles USA Today’s 150 top-selling books and sends it to users of the API. After I read about all of this, my foremost thought turned to how an Internet-connected book could easily be edited and revised by a publisher. Let’s take for example my friend Sean McLachlan’s upcoming book about medieval handgonnes. I read an advance copy of his book and found a questionable use of a word and at least one paragraph that could have used revising. He agreed that the paragraph could be revised, but as he said, it’s already printed and distributed. Now if his book had been an Internet-connected book, imagine what more could be done? Sean or other readers, using an Internet interface, could notify the publisher about an error or revision, and it and other revisions could be packaged out in a free update by the publisher through the Internet. And of course, as Bridle duly notes about Wikipedia pages, the Internet-connected book has the advantage of also maintaining a detailed history of what changes were made and when. Speaking of Bridle, I said that I’d return to his commentary. He mentioned the ethics of those who write “absolutist narratives of the past” that often don’t go challenged. Going back to Sean’s book, imagine that a piece of historical information about a particular handgonne is suddenly found to be false or proven wrong. If the book was an Internet-connected book maintained by a publisher that kept detailed edit histories, the book could be revised by the author to take advantage of the new evidence. Of course there’s more that could be done with an Internet-connected book. McGuire subtly details much of what could be accomplished with an Internet book by pointing out what an e-book can’t do. The implications of such a book being made would be huge not only to your average book reader but also to students, teachers, and academe in general. Imagine owning a technology-related university textbook and receiving updates throughout the semester as things change! But the road to getting there won’t be easily travelled. As with any changing industry, those deeply rooted in the traditional methods of publishing don’t take kindly to these ideas. Many writers, editors and teachers among the traditionalists also scoff at such change. How would the business model work? Would each publisher have their own unique API or would there be some sort of standard API created for all publishers? Would users receive small updates for free but have to pay for large editorial updates and new/revised editions of the book? There will also be other speed bumps along the way. One commenter on McGuire’s blog noted that unwieldy DRM (technology used by media publishers to keep it from being pirated) could put a damper on enthusiastic embracers of Internet-connected books. 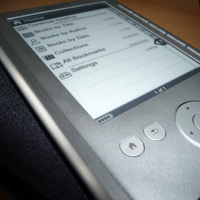 Users already fed up with intrusive (and sometimes damaging) DRM on their software and music may not adopt the Internet-connected book as quickly. I’m excited by the thought of editable Internet-connected books and those people that are paving the way for them. Other’s are not as excited. But change will happen. Will that change lead to books becoming Internet books? Will those authors, publishers and entrepreneurs who embrace such ideas ultimately be more successful? Edit, September 14, 2010: I realized that I foolishly failed to provide a link to McGuire’s original article. I have corrected that. You can also go to it from this link. I also want to add an exciting bit of news demonstrating how at least a few companies are tapping into the market with highly editable, Internet-ready textbooks. I stumbled upon this article on TMCnet.com about a dynamic, customizeable Creative Commons textbook that can be edited and revised by instructors to provide a more relevant textbook. New updates to a discipline, videos and sound files can all be added to the book. While the book isn’t an online entity that can be hyperlinked to (and thus not a true Internet-connected book), it’s a step above what e-books are today, including the ability for students to highlight, search and annotate the digital text. 1 Pings/Trackbacks for "Do Internet-connected books have a future sooner than later?"